I love making crock pot recipes all the time, but particularly in the winter months. One of my favorite things to make in it is a great tasting crock pot vegetable beef soup recipe. Having a big bowl of soup is a great way to warm up on early spring days when the weather is still cool. 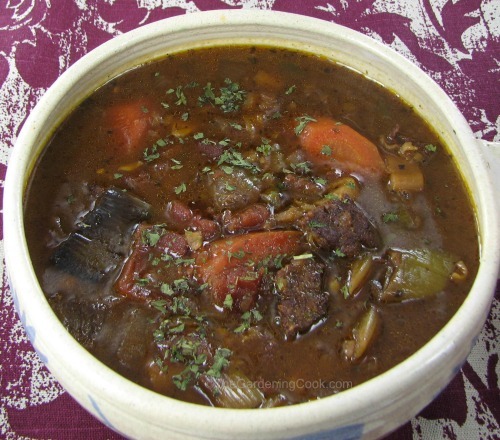 For another great recipe, try my slow cooker vegetable beef barley soup. It’s very hearty and filling. I love using the crock pot to make soups. The appliance keeps the kitchen cool, so I can enjoy the taste of soup all year long. Be sure to also check out my Curried broccoli soup. 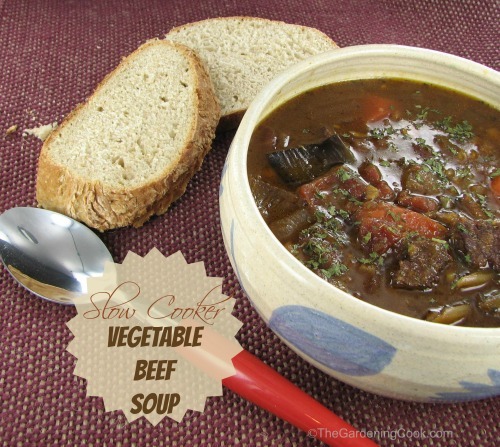 This delicious slow cooker vegetable beef soup is nicely seasoned soup and tastes so good. It is very convenient, too, since it simmers all day in the crock pot. The soup is full of garden fresh veggies. I used celery, carrots and leeks this time but really any vegetables will taste just great. The ground beef was easy to pre-cook and added a great flavor to the soup. I added a bit of sherry just before the end of the cooking time to give it an extra bite of sweetness. Add in a few slices of home made crusty bread and you have a great tasting and very hearty soup. There is no way your family will skip lunch when they have this to look forward to. For more crock pot recipes, be sure to check out my Pinterest Slow Cooker Board. 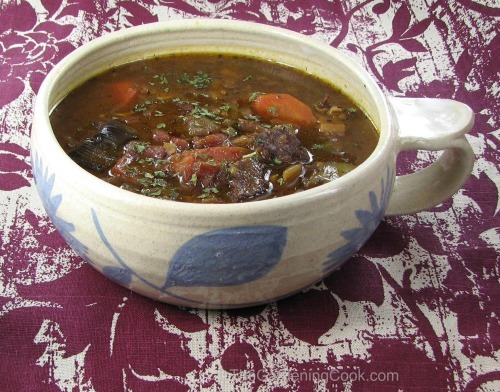 This yummy vegetable beef soup is just brimming with flavor and tender chunks of beef. Make it in the crock pot for ease of cooking. In a nonstick skillet cook the ground beef, garlic and onion over medium heat until meat is no longer pink; drain and transfer to the slow cooker. Add the carrots, celery and leeks to the same skillet and cook lightly, then add to the crock pot. Stir in the rest of the ingredients, except for the sherry and frozen peas. Cover and cook on low for about 6 hours or until vegetables are tender. Stir in the sherry and frozen peas and continue cooking for 1/2 hour. Discard the bay leaf before serving. Serve with warm crusty bread.